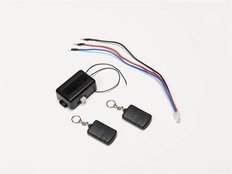 Wireless Remote Control Kits for Luminix LED Light Bars by Putco Lighting - Remote Control Kit (Light Duty) for Putco Luminix LED Light Bar: Control your Putco Luminix LED Light Bar wirelessly with this Remote Control Kit. Kit includes two remotes. Remote Control Kit (Light Duty) for Putco Luminix LED Light Bar: Control your Putco Luminix LED Light Bar wirelessly with this Remote Control Kit. Kit includes two remotes.